Your letters and calls do help! "Our lives begin and end the day we become silent about things that matter" ~Martin Luther King, Jr.
Montana's Department of Fish, Wildlife and Parks (MTFWP) is not only opposed to protecting wolverines, but the agency is expected to get federal permission to allow trapping of other animals within wolverine habitat once the species is listed. Speak up in opposition to continued trapping in wolverine habitat! Unfortunately, comments are being taken only by webform, at that link. So we can't set up an automatic point-and-click letter for you. Instead, please copy the sample letter below, then visit the webform and paste it in, or compose your own copy. Deadline for written comments is May 6. As a U.S. resident who is deeply concerned about the survival of the last remaining wolverines in the Rocky Mountain States, I thank you for your intent to protect wolverines under the Endangered Species Act. I understand that Montana's state wildlife agency, the Department of Fish, Wildlife and Parks (MTFWP), is opposed to the listing of the wolverines and that the agency wants to continue furbearer trapping within wolverine habitat. I urge you not to allow this to happen. 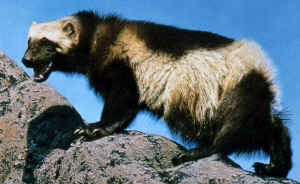 Wolverines are currently threatened with extinction due to climate change, and also due to recreational trapping, even when they are not targeted. There are a mere 300 wolverines left, with an "effective population" size of fewer than 40 individuals. Wolverines have huge territories, and as researchers often state, "wolverines are always on the move," which makes them extremely vulnerable to encounter indiscriminate and baited, deadly traps and snares. Studies in Montana have shown that a large number of female wolverines are pregnant when trappers kill them. Allowing trapping in the habitat of an endangered or threatened species is unethical and contrary to the intent of the Endangered Species Act to prevent further threats to a listed species. Allowing trapping would further threaten the intended and much needed recovery of wolverines in Montana as evidenced by the fact that other listed species, i.e. lynx, are caught and killed in traps every season because Montana allows trapping in core lynx habitat. In recent incidents in Montana, four Golden Eagles were either seriously injured or killed in traps and snares intended for other animals. In addition, more than 50 "incidental" dog captures, two of which were lethal, and several mountain lion captures in traps set for wolves, were reported to MTFWP this trapping season. Montana is the last stronghold of wolverines in the lower 48 states. Please do not allow Montana to continue to put trappers' recreational interests ahead of the welfare of the wild animals the agency has an obligation to protect. I urge you to not allow MTFWP to continue recreational trapping in wolverine habitat. Wolverine conservation for all (people and wild animals) has to trump recreational interests of a few. Thank you for everything you do for animals! Fair Use Notice: This document may contain copyrighted material whose use has not been specifically authorized by the copyright owners. We believe that this not-for-profit, educational use on the Web constitutes a fair use of the copyrighted material (as provided for in section 107 of the US Copyright Law). If you wish to use this copyrighted material for purposes of your own that go beyond fair use, you must obtain permission from the copyright owner. All Creatures Action Alerts: justice, peace, love, compassion, ethics, organizations, Bible, God, Lord, Jesus, Christ, Holy Spirit, grass roots, animals, cruelty free, lifestyle, hunting, fishing, trapping, farm, farming, factory, fur, meat, slaughter, cattle, beef, pork, chicken, poultry, hens, battery, debeaking. Thee is also a similarity to the human aspects of prolife, pro life, pro-life, abortion, capital punishment, and war.